Today was a rainy day in New Orleans. The groups went to a couple different sites, mostly inside. Two groups went to Mr. Earnest’s house to tile, paint, plaster, and install hardwood. We have never seen such a hard-working group of students. Everyone tackled their activities with full force and didn’t even want to take a lunch break. Mr. Earnest touched everyone’s hearts with his story and experience with Hurricane Katrina. He really began to open up and shared photos of his house after the hurricane. It’s safe to say that we definitely helped make a difference in getting him in his house a little quicker. The other group stayed at the church to clean and even got a chance to paint murals for houses around the city! These murals will be used as boards to board up the houses from people breaking in and stealing wood and other materials. The final group went to Mr. David’s house. He showed the volunteers pictures of his house after Hurricane Katrina and the amount of water damage. 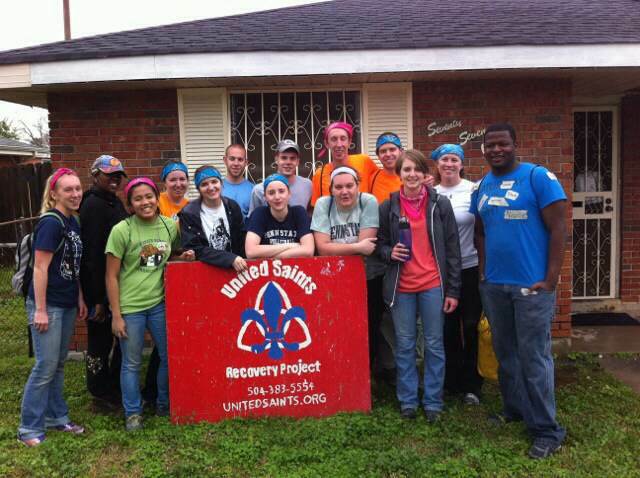 The group helped with mudding, demolition, painting, and worked on his laundry room. For the night, the students got to choose if they wanted to go to Magazine Street, Bourbon Street, or to the French Quarter. One group went to Bourbon Street and enjoyed the must-see culture of New Orleans. Another group headed to Magazine Street where they bonded with a fun walk down town and ice cream! The last group went to French Quarters to search for the amazing Cafe Du Monde. They are well known for their traditional New Orleans French doughnuts called beignets. We all go our separate ways at times, but we’re always creating stronger bonds throughout this trip. The days are flying by, but memories that are being created will last for a lifetime.